Goldfish: Image by OpencageA goldfish can live close to one hundred years if properly cared for, so why do they seem to die so quickly? Keep reading to find out how you can keep your goldfish happy, healthy, and most importantly, alive. Follow these steps to help your goldfish live a long life. For the best health, your goldfish will need not a bowl, but a tank. It's easy to add things to a tank like an air pump that will improve your goldfish's health and keep it alive. Tanks also have filters, which will keep the water cleaner than you possibly could in a bowl, to keep your fish alive. However, tanks can be expensive, so if you absolutely can't afford one, get a large bowl and change the water as frequently as possible. Chlorine found in tap water can kill a goldfish in less than a day. To rid your tap water of chlorine, let it sit out for a couple days to allow the chlorine to dispel on its own. It's also possible to buy a water dechlorinator like Tetra Aquasafe Water Conditioner to neutralize chlorine and other harmful elements that can be found in tap water. Excess food will rot in the tank (or bowl) and contaminate the water your goldfish is living in. To avoid this, don't give your goldfish more than a small pinch of food around feeding time. Goldfish: Image by Protographer23, FlickrAn air pump or an aerator will oxygenate the water so your goldfish can breathe. 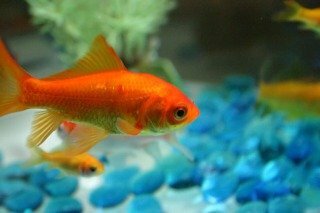 Fish bowls and tanks tend to have poor oxygen flow, which can lead to an unhealthy goldfish. 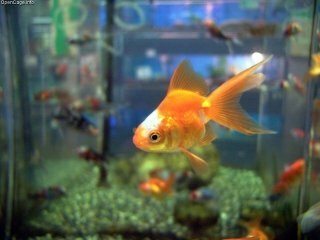 Not only can fish food rot in the tank, but goldfish poop rather frequently. This can contaminate the water, and contaminated water can kill a goldfish fast. Keep your fish tank clean by changing out the water every other day, less if you have a filter, and keeping the tank as clean as possible in the meantime. Fill the bottom of the tank or fish bowl with pebbles and include a mirror or toys to keep your goldfish entertained. This will provide a better looking fish tank, and a decent atmosphere for your goldfish to live in. By following these steps, your goldfish will live a long and healthy life. Have you ever owned a goldfish? If so, how did you keep it healthy? Waves of Fish! The Animal Video of the Day!! !